A clever way for parents to instill Christian values to their children is to make them go to church. Another way of instilling values without having to move, is to pop in a Veggie Tales movie and let it do all the work for you. Don’t get me wrong, Veggie Tales is charming. It just seemed so weird to me that vegetables, of all things, were teaching me about God and Jesus and Moses and all the other biblical bros. Like, I’m pretty sure vegetables can’t read, so unless they’re the new prophets of God, I feel like I can punch holes in this show pretty easily. Did vegetables even exist in biblical times? I feel like people only ate bread and goats back then. Why does that female vegetable have hair and freckles? I don’t get it. Veggie Tales started as a straight-to-movie show in 1993. I don’t think I knew about the show until ‘95 though because I was slightly behind the times. Eventually, in the 2000’s it aired on television for all of those kids who couldn’t live without their daily dose of talking vegetables. The show is hosted by Larry the cucumber and Bob the tomato. Bob is the smarter, normal one, and Larry, you guessed it, is the silly, dumb one. Why is this odd-couple combination of characters so popular and predictable? Tried and true, I guess. Bob and Larry would often use their imagination to transport themselves into biblical times. They would tell these stories in a manner that was easy to comprehend, and probably helpful to most adults trying to understand the Bible and it’s teachings. There were other random vegetables sprinkled throughout the show and used as characters in the telling of the tales. Some of the variety include: gourds, carrots, peas, zucchini, grapes (not vegetables, but okay), and a blueberry (still, not a vegetable). They’re all usually sprinkled throughout the show and barely look anything like the vegetables that they’re supposed to be. What is that green woman in the background? I don’t understand! Often times, the episodes would be similar to Bible stories, but they would have different names. For example, instead of David and Goliath, it would be “Dave and the Giant Pickle” or something totally embarrassing like that. Even as a child, I knew this show was stupid. Not all of the show is Christian themed, luckily. There are parts where Larry sings songs that have to do with nothing in particular. There is also a bit where Larry imagines himself to be a super hero named LarryBoy. If anything, Larry would be the one to eventually get into gambling, become an alcoholic, and make a deal with Satan. I guess the thing that I still can’t get over is the anatomy of the characters. During the opening credits, Bob asks Larry to play the guitar and Larry says, “But Bob, I don’t have any hands!” so Bob gives him a tuba, which you would still need hands for. Bob, Larry and the rest of the gang shouldn’t have eyes or mouths either, but they do. I’m also supposed to believe that they have brains that comprehend the Bible as well. Okay yep. 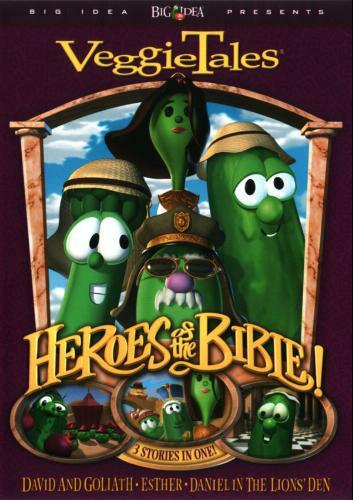 This entry was posted in Direct-To-Video Shows and tagged biblical stories, blueberry, bob the tomato, christian values, church, dave and the giant pickle, david and goliath, gourds, grapes, heroes of the bible, junior asparagus, larry the cucumber, larryboy, veggie tales. Bookmark the permalink. OMG! Just the stupid pictures alone, make me laugh. It’s so random that my brain starts to hurt trying to figure it out. I hate it when one thing makes sense, vegetables don’t have hands, but then they have faces and accessories. What the…? This show is all over the place. If I had to guess I’d say there were too many writers and everyone wanted their idea represented and this was the end result- a show that can only appeal to brain damaged children. hahah! Supes funny, Lil! Good one!! But yeah the pictures are so scary. If anything, the show will confuse children because they’ll think that vegetables can talk. I never realized VT was this old. I never saw it because my parents did make a deal with Satan. He gets gets my soul when I die. I love how much it bugs you about not having hands yet they have eyes, mouths, language, and religion. I wonder how many kids this got into religion. Even worse I wonder how many this got to eat vegetables which I guess you’d never do if you liked the characters. It would be like eating your favorite cartoon character. I didn’t realize it was that old either. Pretty weird. I think it’s better to make a deal with Satan than to watch Veggie Tales. What would Satan even do with a soul? Keep it in a box or something? Hmm. Inconsistency bugs me and I know it bugs you too. Like, they can’t be half vegetable/half human. They should be one or the other. I feel bad for someone if their favorite cartoon character is someone from VT. They’re wayyy too sheltered.